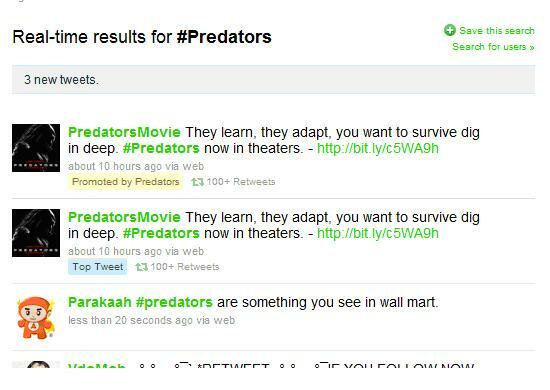 Promoted tweets was the first big development of twitters revenue stream. Paid messages or tweets that would be promoted to the top of searches was to be the start of twitter's advertising model. Starbucks tested this and the news spread rapidly. Twitter said it would launch tests with partners such as: Red Bull, Sony Pictures, Starbucks and Virgin America. Soon after the launch we saw a Promoted Trending Topic arise with the release of the movie, Toy Story 3. An 11th 'trending topic' on your home page that would link to a search stream and have a tweet appear in the top spot with a 'promoted' badge, just like the 'sponsored links' section on Google. It reached a point where I honestly thought every time we have a promoted form of advertising on twitter, it would make headlines. You would get free PR included in advertising costs. Had a laugh, until today I noticed another on Friday the 9th.. 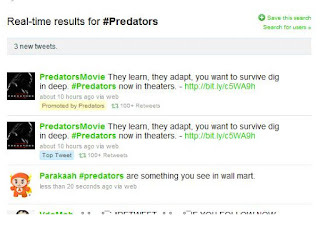 It was another Promoted Trending Topic, Preditors 2010 movie release in the US. This time I found it randomly from twitter. I was intrigued and followed it up. I discovered a new development with twitter, three trending tweets related to the topics host. Promoted advertising on twitter works on a resonance score, where the message needs to be retweeted (RT'ed) or engaged with to remain advertised. Below the top spot, two people got slapped with the 'top tweet' badge. Incentive to promote the brands message! Will the spammers become famous? We can only wait to see until it is fully out of beta. The screen shot below does not quite cut it, but there were two top tweets and the thirds count was 25 retweets (RT)! I went back to try and take the screen shot again, but it had reverted back. 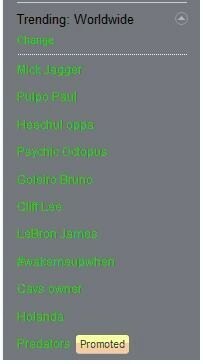 It was late and after about 23h50 all trending topics & tweets were removed from twitter. No more advertising message. To put some prospective on how effective it was for that one day - the video trailer had seen more than 2.6 million views, the website was ridiculously cool and I think it was only a sneak peak for us in South Africa for a while. Please, if you catch any news on twitters promoted advertising and you have a moment - contact me or comment.